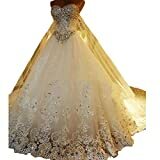 Most classic noble wedding dresses on the models seem so petite and perfect, but will be encumbrance to be worn on the other brides to be, may be the styles of the wedding dress do not match the taste and body type for the brides? Wedding dresses with long trains or trail divides into sweep train, chapel train and cathedral train, of course, there will be more longer than this, while it will be custom made according to the measurements which fit for the bride’s type or figure. 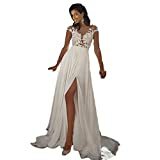 Different length of the wedding dress is suitable for different occasions, most importantly, fit for bride’s figure and taste, then it will reflect the wedding theme and adorn the wedding party fully. Every tiny girl dream to put on gorgeous wedding dresses with long trains when she develops up and becomes a stunning bride in the world wearing white noble royal wedding dresses with long trains walking on the red carpet showing charming side to every one on that wedding day! Noble wedding dress combines tradition and modernity with an artistic vision. Many admires it for its taste and elegance. Just as Princess Diana, Middleton “this dress can be a force of pop culture over the years come, influencing fashion trends and strengthening the sociological meaning white wedding dress.? Just follow the tips, you will own the unique and special wedding easily! First, if you like to choose wedding dresses with long trains or sweep train wedding dress, the venues you choose are vital to your wedding dress, if the venue is so narrow and not smooth, even there are dry branches or sands, that will make people feel so bad. Therefore, beachside, church will be the first choice. 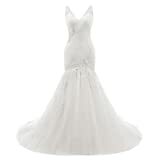 It can make the wedding dress showing fully and completely on the large space. Second, the etiquette is also playing an important role. As a bride, you are the main role on the wedding day, you have to learn some etiquette to make you feel charming and elegant no matter what you said or make pose, as bride should walk around the venue, if you wear a wedding dress with long train or trail, and walk quickly or something, you may stumble and lost elegance. And the other is choosing flower girls, you’d better choose elder flower girls enough to help you to support your wedding dress. 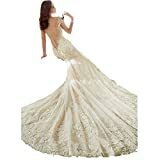 These are simple suggestions for you, if you pay attention to this, may be you will act easily wearing wedding dress with long trains on the red carpet!